Two things took place in tandem last fall: our family began pursuing an international adoption, and I launched a line of handstamped jewelry at sweetTea. The Hubby and I had long spoken of someday adopting a child in need of a family, and late 2009 we arrived at the agreement that ‘someday’ was now. The cost of documents, legal fees, travel, and so forth was staggering, so i chose to get serious about my etsy shop. Through sweetTea, I get to hammer and burnish to my heart’s content, my customers receive silvery pieces of custom goodness in the mail, and this bit of added income helps cover our adoption expenses. A fantastic set-up the whole way around. Four words: trial and error and error and error. Stamping metal is a tricky thing. At the beginning my hammer and I were rarely on speaking terms, but with bunches of steady practice and a healthy dose of vexed muttering, I got the hang of it. Pretty much I love the whole process: the dreaming up new designs; the feel of silver, cold and smooth; the quiet patter of steel shot in a drum; the wire wrapping and packaging. It completely brightens my life when a customer drops me a note to say how much his or her sister or best friend or spouse adored their custom gift. But mostly? I’ve met brilliant people through this shop. Nothing tops the fresh joy of customers and fellow artisans who turn into friends. 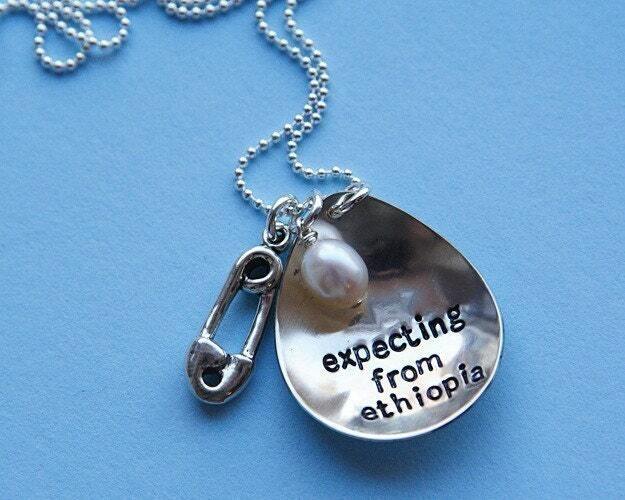 I’m crazy in love with the ‘expecting’ necklaces; the curved shape of the sterling teardrops makes me think of a belly cradling all this hope. Also? I’m near-giddy about the hammered silver wings of the ‘DREAM BIG’ pieces. I relish well-crafted novels (I’m partial to Tolkien and Elizabeth Kostova). I stitch up little-people things and sometimes bake and love playing backyard soccer with my brood till the mosquitoes swarm. I kiss my kids for the sheer pleasure of watching them wipe it off. I’m a fair-weather runner and sometimes-blogger (http://60piggies.blogspot.com). Nicole also wants to offer one of you lucky readers your choice of the following two items from her shop! And for a second entry…leave a comment saying you follow my blog! Make sure to leave your email address as well. I absolutely love the double ring mum necklace. It would be perfect as we have a new addition on the way in October 🙂 What a lovely give away. I love the simplicity charm necklace. So simple and cute! So hard to choose my favorite! 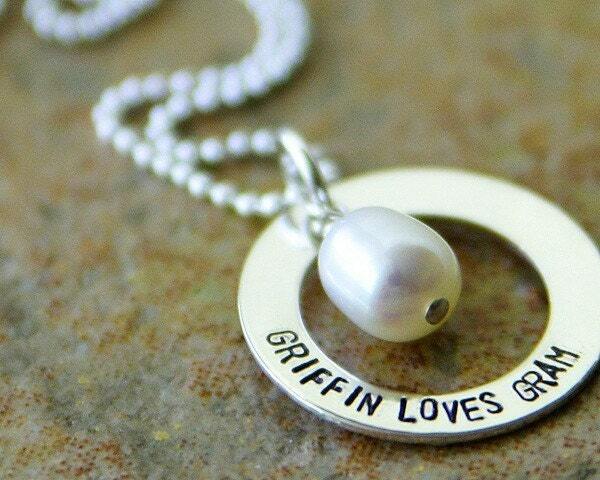 I love the Stamped Mom necklace – double ring! Soo pretty! I'm already a follower of your blog! It's lovely!! Thank you for sharing! I love all the ones whith name son them. I love the stamped silver keychain! I love the single ring stamped necklace, and also the guitar pick!! I love the rustic and sweet heart. All these pieces are so beautiful! I love the 26.2 fly necklace. I would want it to say 13.1 because I am training for my first half marathon. It would be incredible to mark that in such a special way. And of sourse I also love the kids necklaces, too. love the custom handstamped flower necklace! My fav item at the etsy shop was dream big. a hand stamped sterling angel wing necklace. I love the hand stamped blossom necklace! Oo, I love a LOT of things! I love the mothers' necklaces the most. I have followed your blog since the day I found it ! I check it daily! And I have wanted some stamped jewelry for a LONG time!!! Love the giveaway! I love the double ring mom necklace! I love the imagine. inspire. teach. necklace. I'm a teacher, so not only would I love to have one, but I would also love to give this necklace to several other teachers I know. My favorite item is the "faith, hope, and love" necklave. Very dainty and very adorable. I love the silver necklace, topped with a starfish. I have been COVETTING these with my Little Man's name printed on it…pick me! I love the custom hand stamped blossom necklace. Too cute! I love the custom hand-stamped blossom…so pretty! im a follower of your blog !!!!! im torn between the blossom and the classic bar !!!!! they are all such pieces of work !!!!! being a teacher who is heading back to school next week, i love the imagine. inspire. teach. necklace…just beautiful. Hi!I too am a follower of your blog. I love all of it! The bar necklace is really sweet. 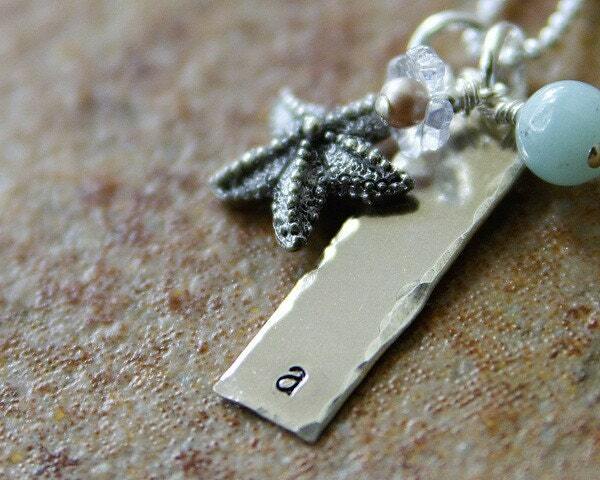 I absolutely love the custom stamped silver necklace topped with a starfish. Would love to win this great giveaway. I love the Mom, dream big, and the blossom. I really liked it all. It's hard to choose. I am a follower of your blog and love the great ideas you have. I'm a follower and she is a favorite in my etsy shop. My grandson would love that guitar pic since he is learning to play, and is now playing in church. I really like the family necklace. Thanks for a great giveaway. I love the double ring necklace – fantastic! Oh, I love the double ring necklace. It's perfect for information about my cute little family! I love all her stuff! In particular the blossom, soooo sweet. 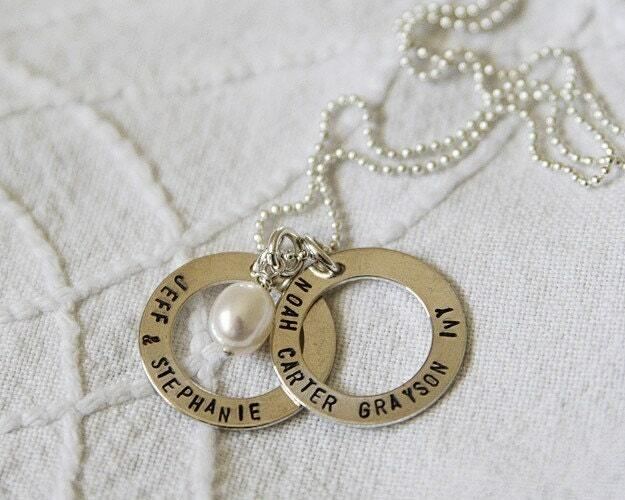 I LOVE the family custom necklace! Gorgeous! Love the sterling bar topped with starfish and the double ring mother one…Actualy they are all great! i love the single ring necklace and the dance. a stamped sterling necklace. I love the double ring mom necklace! So cute! I love the swivel bar necklace! I follow your blog; keep up the good work! I love the single ring necklace! So perfect! 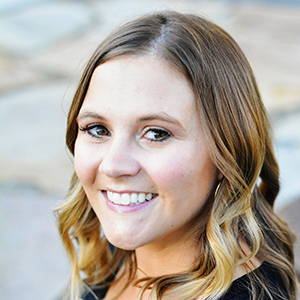 I follow your blog… I'm addicted! My favorite is the adoption necklace as we just adopted from China 4 months ago! The Mom necklace is really nice and I also like the 'Dream Big' necklace. She makes such beautiful jewelry! Thanks for the chance to win! I would love the simplicity: a charm necklace. LOVE your work!! Thanks for the opportunity for such a great giveaway! I love the double ring mom necklace as I am a mom of two! i just love the simplicity. a tiny charm necklace!!! how gorgeous is this necklace! and its perfect; i have three kids so this would work perfect! I love the single ring necklace! I love the Dream Big ones the angel wings are adorable! I also like the starfish stuff cute! This was tough because there were so many cute designs, but I loved the 'dream big. a hand stamped sterling angel wing necklace' the most! I love the double ring mom necklace. I just had my last baby so can finally start looking at stuff like this without worrying how to add another! I love the single ring necklace…as well as everything else!! I love the Phillipans 4:13 one! I really like the custom hand stamped blossom necklace. Oooo. . .so hard to choose but I think I must pick the hand stamped blossom necklace. Hard to choose…I love the je t'adore necklace…I lived in France for awhile! I also love the mom necklace! Thanks for sharing such talent! I love the custom sterling heart! I absolutely adore the "precious in his sight" necklace. What a great reminder. its a tossup between tiny initial and the double ring mom necklace! My favorite is the simplicity. a tiny charm necklace. LOVE the custom stamped blossom necklace. the give away pieces are awesome too. Love the simplicity. tiny charm necklace:) a great gift! I love the tiny initial necklace. I'm having a baby in 5 weeks so this would be perfect! I love the je t'adore necklace! So hard to choose… I love the stamped blossom necklace. Simple but so adorable! I love the double ring mom necklace. Simple yet elegant. It would go with anything. I just found your blog and am so a follower. Thanks for all your ideas! i don't even know if you can actually play with a metal pick, but I loved the custom stamped pick! It would be a great hubby gift! I am definately your follower! I love your blog! I love the hand stamped single ring necklace and the blossom necklace!